Scenario: From H. Rider Haggard's novel of the same name. Notes: 1. A full page advertisement in the October 30a, 1915 issue of The Moving Picture World noted that on November 6, 1915 the film, The Bubbles in the Glass, would be released. 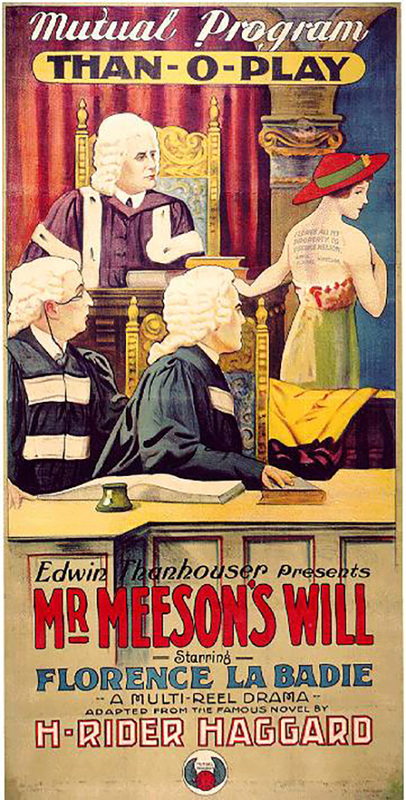 Apparently the advertisement was run in error, for the film was not released until January 4, 1916, and various trade schedules list Mr. Meeson's Will as the Thanhouser picture actually released on November 6, 1915. 2. This film was produced in September 1915 as a four-reel Mutual Masterpicture; then it was edited and released in three reels as a Than-O-Play. 3. An article in The New Rochelle Pioneer, September 18, 1915, listed George Barnes and Samuel Swinburne as members of the cast. "'Mr. Meeson can't see you, ma'am.' Augusta Smithers, care worn and weary-eyed from many sleepless nights of watching beside her sick sister, turned, despairingly, to leave the office. Her letter asking Meeson & Wells, publishers, to advance her money on the sale of her novel, Jemima's Vow, recently in its second edition, had brought only curt refusal. And now she had failed to gain a personal interview with the head of the firm. 'Pardon me,' a courteous voice broke in upon Augusta's hopeless reverie. 'I am Mr. Meeson's nephew. Can I do anything for you?' The girl looked up into the frank, dark eyes of Eustace Meeson - and then, with a grateful, gently apologetic movement, she opened her purse and handed him his uncle's note. "'Let me introduce you myself, Miss Smithers,' said the young man, heartily, bowing Augusta into the private office. Ten minutes later, she came out again. The drooping lines of her face and slight figure once more had settled into complete despair. Behind the door which she had just closed, Meeson was speaking to his nephew. 'I know how to deal with cases of that sort,' he said. 'Double work and half pay.' Eustace's face flamed with anger. "You made a fortune on her book,' he retorted. 'I think your conduct has been shameful.' For a moment, Meeson stood glowering down upon the young insurgent. Then he reached for the phone and called up his lawyer. When that dignitary entered, the rich publisher's orders were brief. 'Make out a new will,' he said. 'I am disinheriting this puppy.' A few days after this, Eustace went to see Augusta. He found her alone, and inconsolable in her grief. Her sister was dead. 'If they had paid me fairly for my book,' she told him, brokenly, 'I could have saved her.' Returning a week later, Eustace learned that the girl had given up her rooms and left England. Nobody could tell him her address. It was then that he realized fully that he loved her. "Augusta, meanwhile, stood on the second cabin deck of the Prince Edward, ploughing its course to New Zealand. She had cousins in Wellington. Among new scenes and new faces, too, she might forget her sorrow. Presently she was aware of James Meeson approaching. She could not avoid catching his eye, and he scrutinized her coldly. Then he spoke. 'A man in my position' - the words came pompously, slowly - 'can not afford to recognize second-class passengers. So, remember - we are strangers.' He passed on. She was still leaning against the rail, when a sailor, sent by the captain of the ship and by Lady Grant Holmhurst, came to identify the writer of Jemima's Vow. All within a few minutes, the lonely, heartsick little Englishwoman found herself in a cabin deluxe, surrounded by friends who had long been admirers of her talent. James Meeson could 'afford' now to claim Augusta's acquaintance. But she recoiled from him. When Lady Holmhurst and her party understood why, the publisher found himself ostracized from their circle. "There were no writing materials in the party. The sight of the tattooed arm of one of the sailors, however, suggested to the girl a solution. The needle and the juice of a cuttlefish were at hand. Augusta offered her bare back, and the sailors pricked into the tender skin the last will and testament of James Meeson. That night he died. Two days later, a passing ship rescued the little handful left from the wreck of the Prince Edward. On arriving in London, Augusta found a legal contest in progress over the rich publisher's will. She went with Lady Holmhurst to reassure Eustace Meeson. On meeting again, the shock of joy they felt was mutual. But Augusta, suddenly mysteriously happy, would give the young man no inkling of the cause of her gleeful satisfaction. On the last day of the trial, however, presenting herself in a low-cut ball gown before the court, she bared her back to the astonished judge and jury. At last, alone in the deserted court-room together, the young heir of the Meeson fortune gazed pleadingly into the face of the girl, who for his sake, had undergone the tortures of the tattoo needle, 'The law has given me the estate, but I want also the copy of the original will.' With a smile she was in his arms." "This is a three-part adaptation of a book by H. Rider Haggard. Flo LaBadie plays the feminine lead with good effect. The story is, of course, rather an improbable proposition and has not in it the realism that the present day public craves. Nevertheless, it is an adaptation of a well-known literary work, and, as such, will be accepted above the ordinary."